The DOAP Team is often the first point of contact with vulnerable individuals in the community, and this is a critical first step in connecting these people with the support that they need. Anyone looking for support with addictions and transportation can call the DOAP Team at 403-998-7388. If you find a needle in the community and want assistance getting it picked up then call the Needle Response Team 403-796-5334. 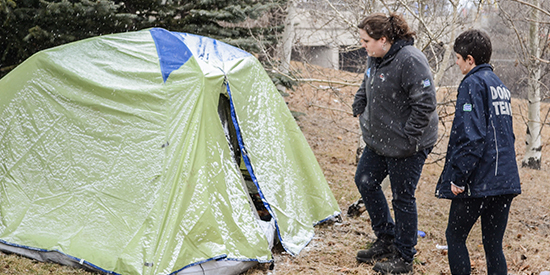 If you are sleeping rough or need information on getting a housing assessment (VI-SPDAT) completed for Housing First programs, please call Encampment at 403-805-7388. The DOAP Team first went into action in 2005 and offers a collective response to substance abuse in Calgary communities. The DOAP Team is an alternative and more appropriate response to substance abuse issues and public intoxication, resulting in reduced pressure on Calgary Police Services (CPS), Emergency Medical Services (EMS), Transit, Bylaw and local city hospitals. The team seeks to remove barriers for individuals with multiple risk factors, such as street issues, by coordinating access to a range of medical, shelter, housing, and addiction programs. Finding someone a safe place to stay creates the opportunity to connect them with the social support that could help facilitate a positive change for them. In 2014, a third party Social Return on Investment study showed that the DOAP Team creates a social value of $9.43 for each $1 invested. The Encampment Team reaches out to people who are sleeping rough and offers to provide them with assistance into housing. They also do intake for our housing programs and are trained to do SPDAT assessments for those looking to enter a Housing First program. They work closely with the City of Calgary Bylaw Services to help provide resources to this population. In January 2019, Alpha House launched a Needle Debris Program supported by grant funding from the Government of Alberta in response to growing public concern about needle debris and to create a more efficient and cost-effective response to this issue. The program will focus on having a response line where Calgarians can call to report if they have found needles on private or public property. The team will also be doing pro-active sweeps in the community looking for needle debris and providing training on how to discard of needles safely. Hours of operation are 8:00am – 6:00pm. Needle debris can be reported to (403) 796-5334. Connect 2 is a partnership between Alpha House and CUPS Health and Education Centres. The team connects with homeless patients who are in hospital and helps support them with social and health care needs, both during their hospital stay and once they have been discharged into the community. The goal of the program is to reduce inappropriate use of the health care system while assisting with better health outcomes for this population.